Intex SMPS or PSUs are very popular in India because of their lower price and easy availability. Intex is an Indian brand but all of their products are made in China. Intex sells computer & IT accessories, smartphones, and tablets. Their products are relatively cheaper and so are very popular among users in India. Intex SMPS is very popular in India because it is dirt cheap, readily available and claimed higher wattage. Intex SMPS Techno 450 is such cheap PSU from Intex which is advertised as 450 Watt. Here I am going to review Intex SMPS Techno 450 and tell you about its quality, performance and why you must avoid this SMPS at any cost. Below you can also read the important articles on SMPS which I have written in this blog. Here is the complete review of Intex SMPS Techno 450W and its technical specifications. The overall build quality of the SMPS is very bad. The SMPS looks like that it is made from a tin can. The quality of cables, wires and connectors are bad too. 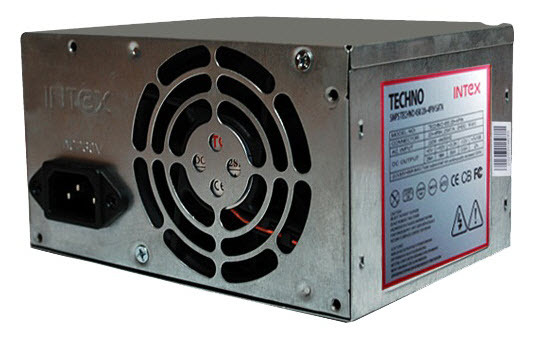 The power supply is also very light which indicates that low quality components used in it and without much heatsinks. The exact model number this SMPS is IT-2045S. That’s all I have to say about the build quality of this SMPS. This Intex SMPS comes with an 80mm fan on the back side of the PSU. The fan is of very low quality and becomes noisy after some time. The SMPS also comes with basic cables and connectors which are mentioned below. There is no wire mesh on the main 24 pin motherboard connector and the quality of wires is not good either. Now we come to the most important factor of a SMPS which the amount of current present on the 12V Rail. For a modern day PC it should be minimum 30A but in this Intex SMPS it is 18A which is too low even for a average modern day PC. If you have this SMPS then don’t ever think of adding a graphics card on your PC because you will invite huge trouble in doing so. This is because this SMPS may cause damage to one or more components of your PC if it is unable to handle the load of your desktop PC. As I have explained many times in this blog that the current on +12V rail matters the most in a SMPS because this rail is responsible for providing power to all the major components of your PC that includes processor, motherboard, graphics card, hard disk, fans etc. So here we calculate power by multiplying 12V x 18A we get result as 216 Watt. So it concludes that it is only a 200 Watt SMPS and definitely not the 450 Watt. 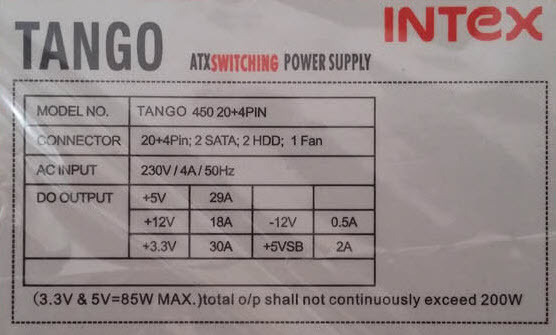 Note: There is another SMPS model from Intex which is Intex SMPS Tango 450 20+4PIN. This SMPS has the same exact specifications as the Techno one mentioned in this post. I don’t trust it but the company says that this SMPS comes with features like Short Circuit Protection (SCP) and Over Power Protection (OPP). This Intex SMPS is priced at Rs. 650/- and comes with 2 years manufacturer’s warranty. You can check the latest pricing online by going to the link given below. Intex SMPS Techno 450 20+4PIN is low quality and cheap PSU that has total output of only 200Watt. You should not confuse this SMPS as a 450W SMPS and if you are looking for a good branded and affordable 450W SMPS then you should get Corsair VS450 for your PC. At last I would like to say that you must totally avoid this Intex SMPS if you care for your Desktop Computer. 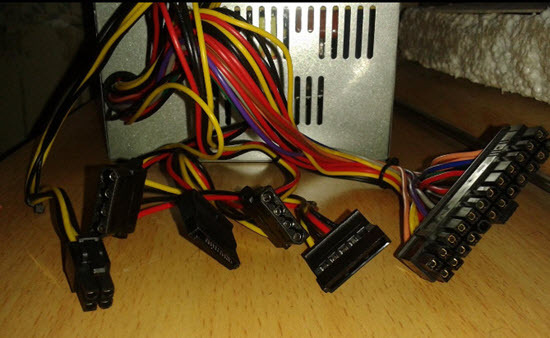 I have intex 450+20 and I have to buy graphics card gt 710 which require 300 w should I replace smps? I think you should replace your SMPS to VIP or Corsair. i have the same psu i will be buying rx 460 which doesnt require any power connectors. will this psu work with it? I strongly suggest not to. You should get yourself Corsair VS450 PSU. I am having a zebronics chalet case can i install a corsair vs 450 in it ?